Eating breakfast is an interesting concept. For busy students or those in the work force who hurry each morning to get some place, it is a meal often overlooked or grabbed on the fly. Others, who are less pressed for time, might choose to chow down on plates piled high with gut-busting selections, satisfied that they are compliant with the data that says breakfast is the most important meal of the day. Then, there are the diet-conscious who skip the meal...certain that eating breakfast makes them more hungry and more susceptible to binging...to them, I say, "It's the carbs..."
Carb consumption is at a all time high. Most grocery stores have whole aisles devoted to cereal, most of which are just boxes of refined grains laced, coated or infused with sugar. The bread section is not much better...squeeze many of the loaves and you can tell that the main ingredient...no listed of course...is AIR which is surrounded by the refined contents. A few feet farther down you find boxes and bags of doughnuts, glazed rolls and ultra-sweet breakfast snacks. Don't forget to swing past the jams and jellies...sugar, sugar, sugar...all carbs. A person who eats this unbalanced food for any meal will most certainly feel hungry a short time later...Consumption of carbs without fiber give us the highs and lows...the headaches...the weight gain...and can lead to many well-documented health problems. Combine peanut butter, ground flax seed, chopped dates and margarine in a small bowl; microwave for 10 seconds and mix well. Toast the sandwich thins. Spread peanut butter mixture evenly on the four halves of thins. 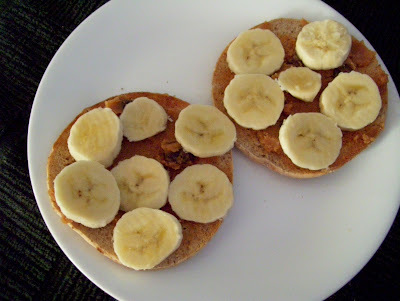 Slice the banana thinly and divide slices evenly on each coated round half. Makes 2 servings. * I used Orowheat Multi-grain Sandwich Thins. They only have 100 calories each, 11 gm. whole grain, 5 gm of fiber and 0 gm of Trans fat.